Parents looking for mid- term holiday activities for their children are welcome to a “Family Fun Morning” and young people can hang out at a Youth Café. For food lovers, men can tuck into a hearty breakfast, seniors a free lunch, and for couples there is a romantic Valentine’s Day Dinner at the Oriel House Hotel. Visitors to Ballincollig Shopping Centre on Saturday 11th February can meet some of the Connect 2012 team for face painting, story telling, etc. Events for all ages include the Saltmine Theatre Company, and excellent communicators Bishop Ken Clarke, his wife Helen, along with George and Eunice Newell, who are no strangers to Cork from their time in Blarney Parish. Even pet lovers are invited to bring their canine companions to a “Dog’s Tea Party”! 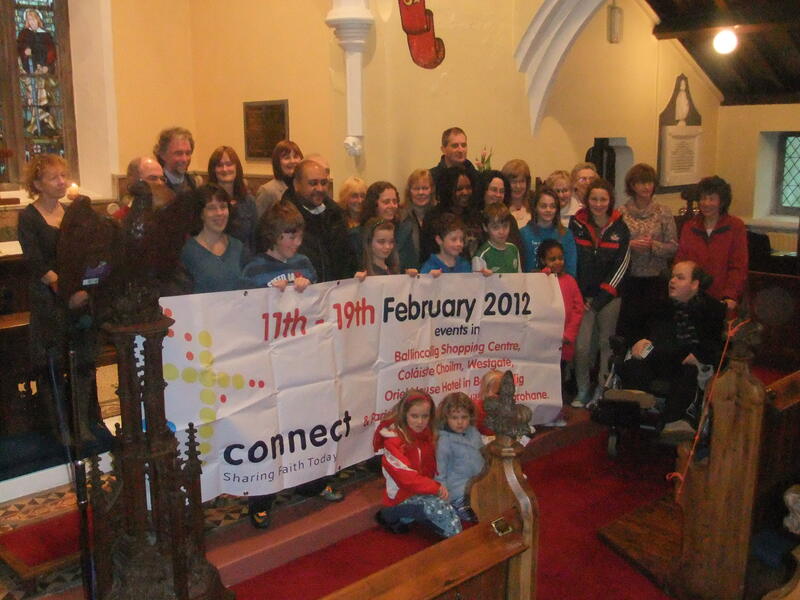 Members of Carrigrohane Union of Parishes at the launch of Connect 2012.